Last year I made a trio of denim pumpkins out of a pair of my husband’s old jeans. I had so much fun cutting up those jeans creating those pumpkins that I decided I had one more (at least for now) pumpkin craft in me. In the spirt of reduce, reuse, repurpose and pumpkin-fy everything, I decided to DIY a leather pumpkin. Yes, leather! Everything else has been used to decorate faux pumpkins. Why not leather too? 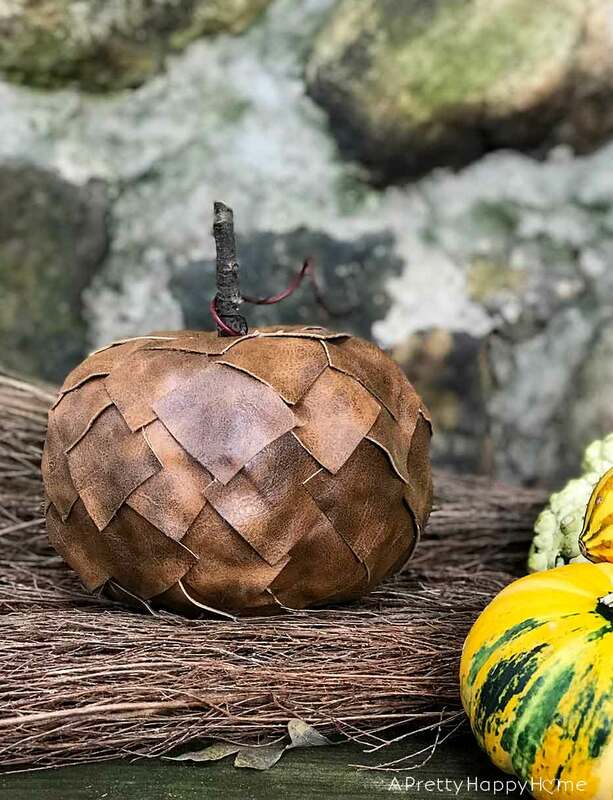 If you’ve been following this blog for a hot minute then it won’t surprise you that the leather for this pumpkin project came from a pair of old boots that I cut apart. My favorite boots! The boots were not repairable and would not make a good donation, so that’s why I cut them apart to use the leather for crafty projects. I think the leather might look better on this pumpkin than it ever did on my feet! You be the judge. 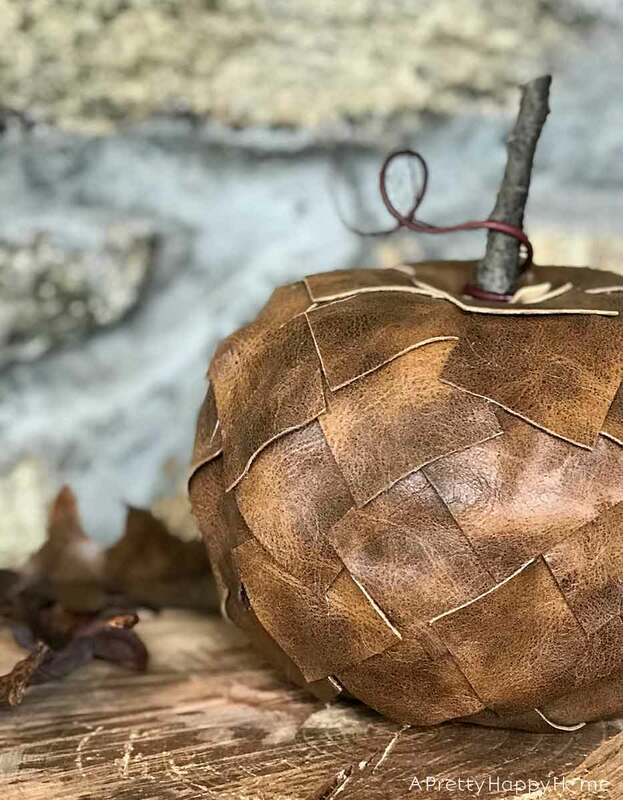 If you have a faux pumpkin, scissors, scrap leather (faux or real) and a lot of hot glue , you too can make a leather pumpkin. If you don’t have a pair of old boots that you want to cut up for this project, then you can always buy a sheet of leather from the craft store or there are a lot of options like this on on Amazon . You probably don’t need this tutorial on how to DIY a leather pumpkin, but I like to hear myself type. First, your faux pumpkin is probably going to have a stem. If it doesn’t have a stem is it even a pumpkin? My pumpkin came from the Dollar Store and it is very easy to cut the stem off with a knife. If you’ve never cut into one of these pumpkins before, you’re missing out. The pumpkin is probably going to be hollow, which is a less fancy way of saying carvable. You’re going to replace the faux stem with a twig that you scavenge from your yard! Or your neighbor’s yard. I won’t judge. I chose to add the twig as the last step, but you can be a rebel and add it at the beginning. Second, decide what design you want on your pumpkin. I wanted a pumpkin with lots of texture, so I cut out small squares from my piece of leather and overlapped them on the pumpkin in a quasi-patchwork pattern. You could do stripes, circles, leather braids. There’s no right or wrong! Have fun with it! Third, get your glue gun ready! I worked from the top of the pumpkin down glueing each leather square on individually. Your design is going to dictate how much glue and how long it takes. It took me about 30 minutes plus a few interruptions to help with math homework to glue the leather squares on this pumpkin. Last, add your stem. If you have a fat twig, you might be able to just wedge it in the pumpkin and it will stay. My twig was pretty thin, so I trimmed it to size and put a dab of hot glue on the end of it before inserting it in the pumpkin. The glue insured the twig wouldn’t move around, which I tested by accidentally dropping the pumpkin during this photoshoot. I did have to add a few small of pieces of leather to cover the gaps around the twig. The curly-Q on the stem is from a sprig of faux branches I had on hand. (I realize the irony of adding a faux twig to a real twig.) I thought the curly-Q made the pumpkin look more like a pumpkin and less like a caramel apple. Now, sit back and revel in your handiwork. You can even humble brag to your friends! I would. I am rarely (if ever) unique in ANY of my crafts and DIYs, but I did a quick Google search as I was finishing up this blog post and realized leather pumpkins don’t really seem to be a thing. At least, not ones made out of leather scraps from an old pair of boots. I can’t imagine why not!? There’s a fine line between oddball and trendsetter, but I’m okay with that! 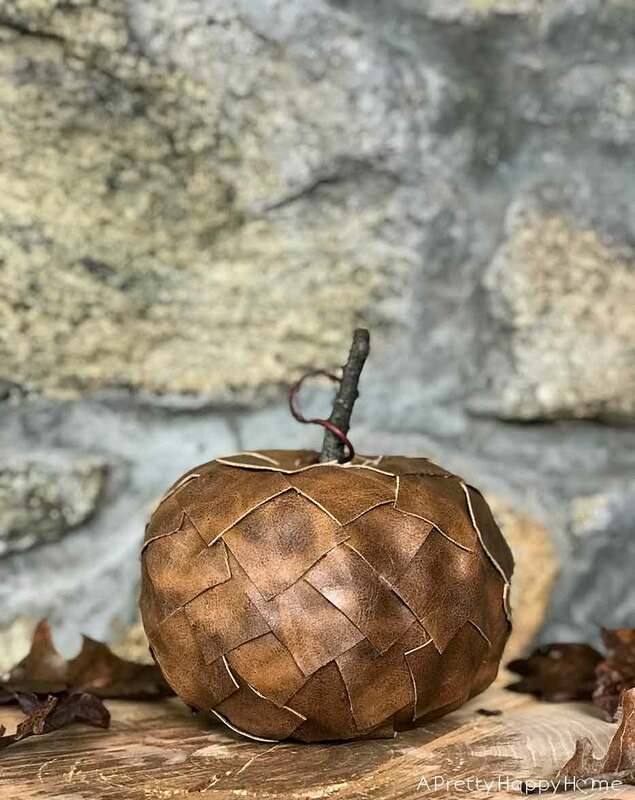 If you DIY a leather pumpkin, it would make me so happy if you shared the pictures. I want to see your creation! Let’s be oddballs trendsetters together! Hey! Thanks for visiting my blog today. It makes my day to share these stories with you and I hope it brightened your day as well. 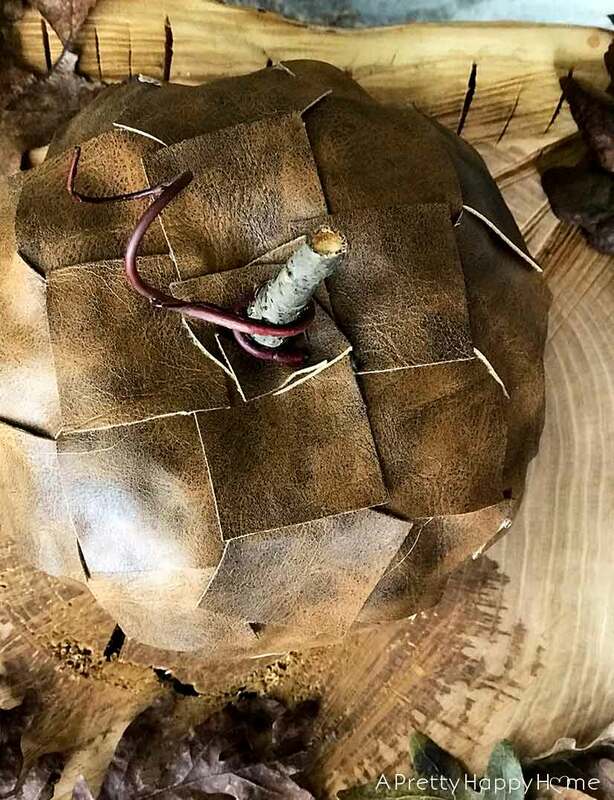 If you liked this DIY Leather Pumpkin, here are some other posts you might enjoy.